Deadly chlorine gas was likely used in an attack that took place in a Syrian town in rebel-held Idlib last February, said the United Nations-backed chemical weapons watchdog on Wednesday. The report, released Tuesday by the fact-finding mission of the Organisation for the Prohibition of Chemical Weapons (OPCW), concluded that “chlorine, released from cylinders through mechanical impact, was likely used as a chemical weapon on 4 February 2018 in the Al Talil neighbourhood of Saraqib”. The report said that their finding was based on the presence of two cylinders, which were determined to have containing the banned gas, together with samples that showed chlorine was unusually-present in the local environment. The conclusions were also based on eye-witness testimony, and the number of patients showing symptoms indicating exposure to chlorine and other toxic chemicals. The report noted that 11 men had arrived by ambulance, all within the same hour, at medical facilities seeking treatment. Patients displayed nausea, eye irritation, shortness of breath, coughing and wheezing. Saraqib is located about 20 kilometres south-east of Idlib and was not under government control at the time of the attack, said the OPCW report. The fact-finding mission was set up in 2014 in response to persistent allegations of chemical weapon attacks in Syria with a mandate to establish only the facts. It does not identify who is responsible for alleged attacks. A joint OPCW-UN investigation panel looking into attacks in Syria, set up by the Security Council to identify perpetrators, was disbanded last November, when Members were unable to agree its extension. 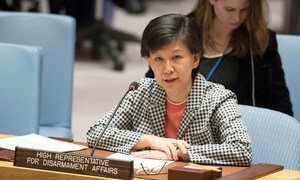 A technical team sent by the Organisation for the Prohibition of Chemical Weapons (OPCW) to the site of an alleged chemical weapons attack in the United Kingdom has identified toxic agents consistent with the UK’s initial investigation, the top United Nations disarmament official told the Security Council on Wednesday.